Belated sequel to Ang Lee’s Oscar-winning transnational phenomenon Crouching Tiger, Hidden Dragon (released in 2000), although it’s safe to say this follow-up won’t be troubling any award shows any time soon. It’s a cross-cultural wuxia film designed by a committee of investors, funded by American companies Netflix and The Weinstein Company in collaboration with the Chinese state-run China Film Group, filmed in New Zealand and with a cast talking in English. The language choice may be a cause of concern for some, but let’s not forget how both Michelle Yeoh and Chow Yun-fat had to recite their Mandarin dialogue phonetically for the first film as neither of the actors could speak the Chinese dialect. At least this puts pretense to one side by openly embracing its commercial intentions in wanting to appeal to a western audience. The stock dialogue is more disconcerting, pitched somewhere between grand, wistful platitudes and ‘olde worlde’ English in which characters shout things like, “confine him and secure the compound!” There is none of the hierarchical and generational conflict which lies at the heart of the original film (embellished by Ang Lee and his US writing partner James Schamus from a wuxia novel by 20th century author Wang Dulu), nor the postmodern feminist refinement of the female knight-errant archetype as portrayed in wuxia fiction. By putting action director Yuen Woo-ping in charge (the fight choreographer on the first film), this sequel seems all too eager to simply build to a really big fight scene, incurring as many smaller fight scenes along the way. The swordplay has little of the same narrative power as Woo-ping’s exemplary work in the first film, and overcompensates by slipping into a number of slightly clunky CGI moments. 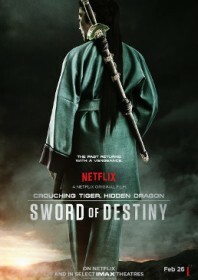 The premise essentially revolves around a relatively generic quest for possession of the Green Destiny sword – Li Mu-bai’s prized possession from the first film – with Jason Scott Lee playing the warring Ching dynasty general who sends his Mortal Kombat-like minions out to claim it. There is an attempt to develop a similarly tempestuous young romance between the vengeful wannabe female knight-errant Snow Vase (Natasha Liu Bordizzo) and the misguided bandit boy Wei Fang (Harry Shum Jr.), which is a bit like the Zhang Ziyi and Chang Chen relationship at the heart of the original film. But the romance is compromised by an overload of additional narrative threads. There are references to some of the first film’s most iconic scenes: a hired troop of assassins with typically elaborate jianghu names like Thunder Fist and Iron Crow and Flying Blade makes a passing nod to the wonderful tavern sequence in the original film, but then the gag buckles under the weight of trying to flesh out their individual backstories. There are also echoes of those glorious rooftop flying sequences, but given that 16 years have now passed and the effect has been done to death in everything from mainstream action movies to TV commercials, the scenes just don’t possess the same magic. But the greatest shadow of all is cast by the angelic presence of Michelle Yeoh who returns as the now widowed wanderer Yu Shu-lien. But the film even sells her short in handing the bulk of the glory over to Donnie Yen‘s hired swordsman, Silent Wolf. As a result, Yeoh switches to autopilot. In taking such a polite and reverential approach to the themes from the first film, this sequel ultimately lacks an edge of its own, and simply serves as a reminder of the brilliance of Ang Lee’s original.